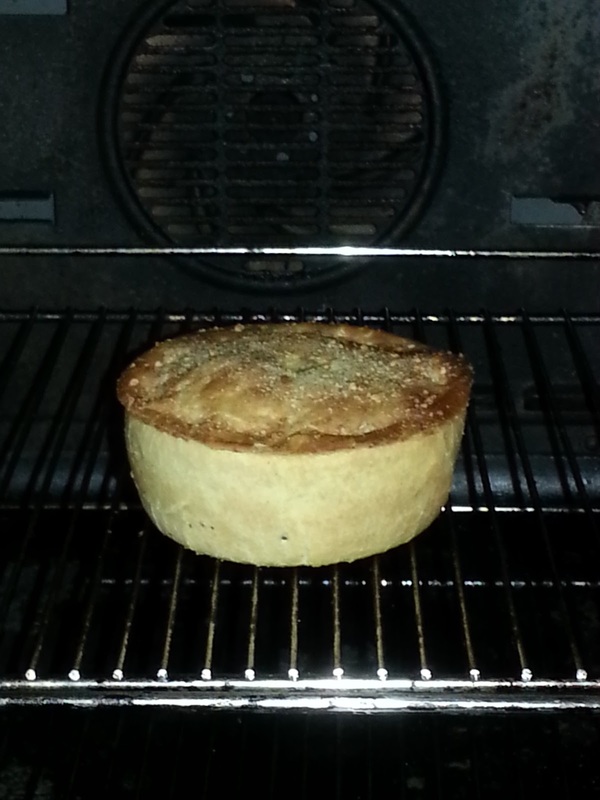 Those that know me will know I've been talking quite a lot about a certain pie I've recently eaten. 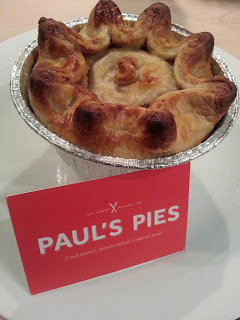 I present to you: Paul's Pies. 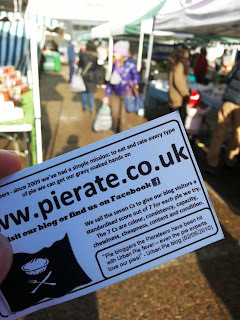 I was attracted to the London Farmers Market at Notting Hill Gate on the search for a really great pie. And what do I come across? 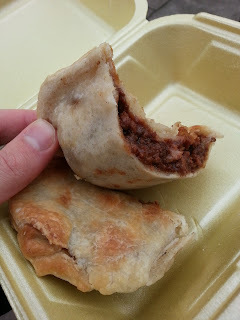 A Paul's Pie stall! 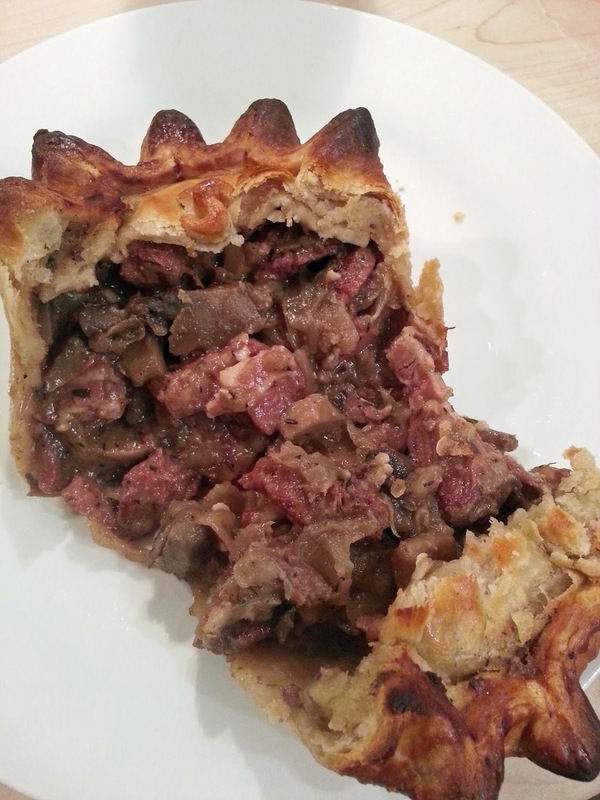 I'd heard a bit about Paul's Pies before - after all, they are a British Pie Awards silver winner 2012 (and a Gold award for his Venison and Mushroom pie), and that sort of acclaim does not go unnoticed by Pierate HQ. I'm delighted that the man behind the stall is actually award-winning pie maker and genuine nice guy Paul himself. It's nearing closing time at the market, but luckily Paul still has a few pies left. "I came here this morning with 60," says Paul, pointing to the table where all that remained was about 8 pies. 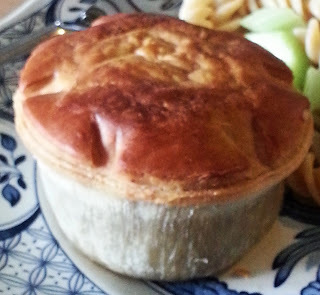 There's a venison pie, a chicken pie, and this Steak and Guinness pie. I go for the Steak and Guinness. The demand for a Paul's pie is obviously high. As I speak to Paul about his business a bit more, another customer arrives at the stall to buy a pie. "I've heard they're the best," she says, taking a pie from the ever-dwindling stack. High praise indeed. 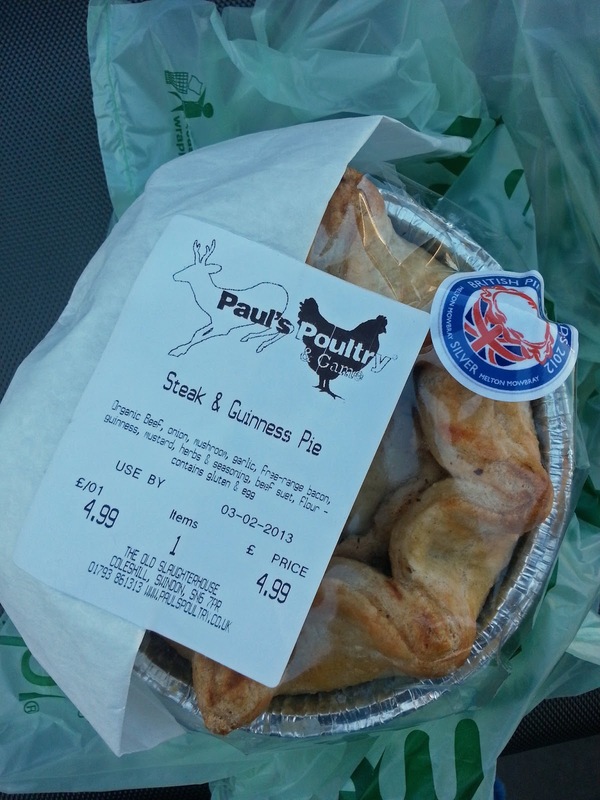 So this is the Paul's pie in question. It normally comes in a red box if you buy it from a shop, so I've added the red card here to help me imagine the red box. What strikes me is that the pie is massive. 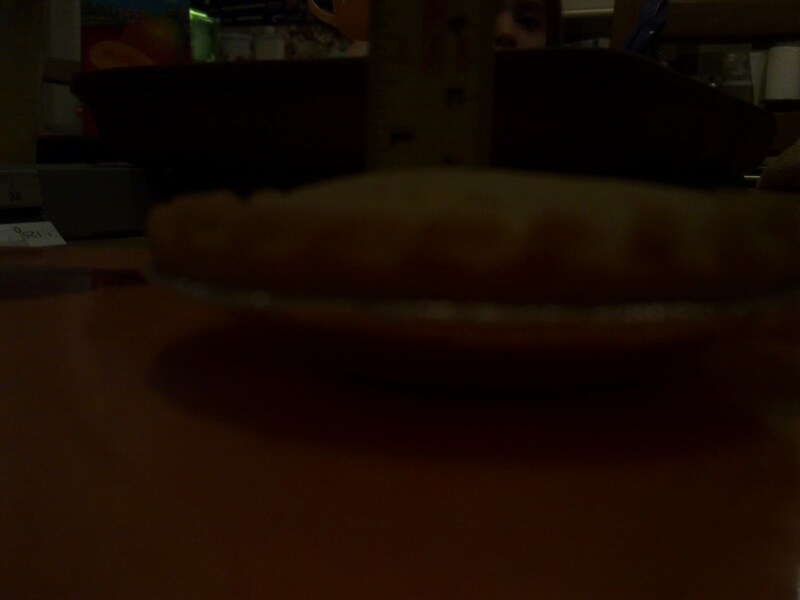 If only I could find the kitchen scales then I'd weigh the pie, as I'm sure it's weight would be quite impressive. Yes, it's £4.99, which is by no means the cheapest of pies, but if this pie delivers then it's money well spent. If you're looking for a budget pie then the price tag may put you off, but the pie is actually so large it's a meal in itself. The crimping and colour is pretty awesome, and after it has been heating in the oven for a bit then there's quite a nice golden caramelisation developing. The condition is great considering how large this pie is - I'd be concerned about the pie collapsing under its own weight but it holds up pretty well. Pretty impressive, right? If that isn't full marks for content then I'm not sure what is. The pie is stacked to the top crust with content. I can see the tender chunks of steak - which is even still a bit pink, wow! There is a mixture of roughly chopped and finely chopped onion, mushrooms and even bacon. This is epic. I'm relieved that the pie also tastes as good as it looks. The steak is not at all chewy, and for a pie that looks like it doesn't have much gravy, all the ingredients are moist and delicious. There is a great peppery element to this pie as well, giving it a great kick alongside the Guinness. The pastry is also supreme. This pie is stunning to look at, hefty, and a taste sensation. 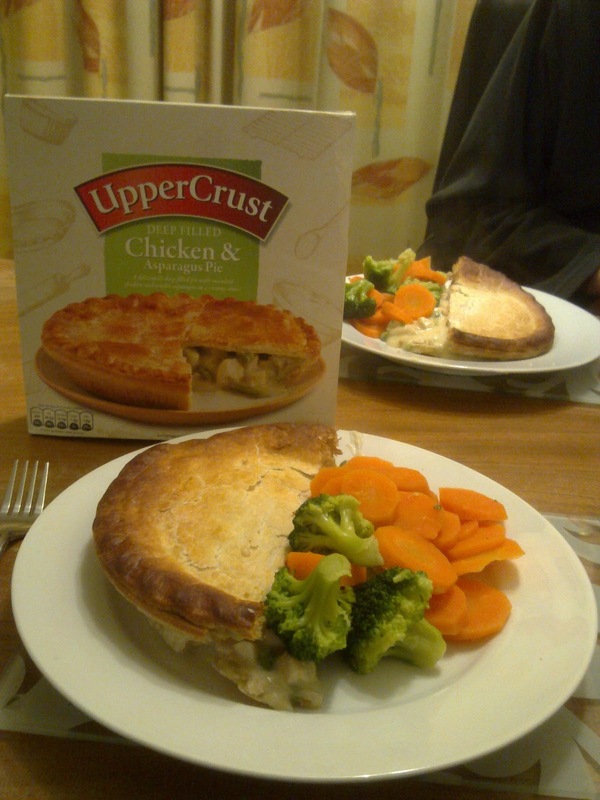 It's the ultimate comfort food, something which Paul tells me he strives for when he makes his pies. 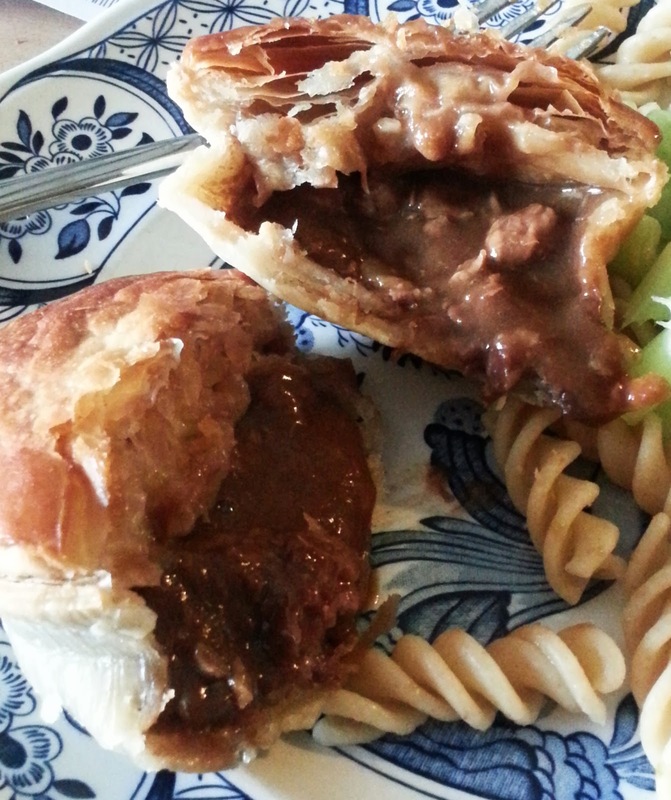 The British Pie Awards have got it right in awarding this pie very high honours. 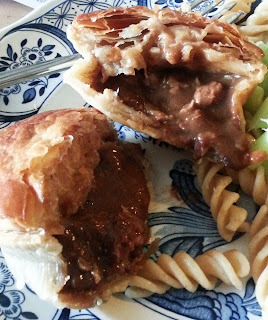 I'm bowled over by this pie, which puts so many other pies to shame. It's epic in every way I can imagine. continue reading "Pies from Paul, it's Paul's Pies"
continue reading "A Pie Review: In Haiku"
continue reading "PieTunes for the Top 20 over 6!" continue reading "Will they get an Uppercrust on their opponents?" 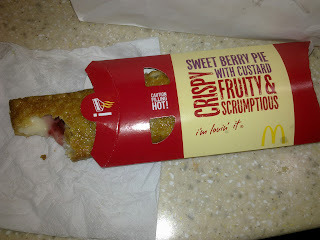 continue reading "ASDA Pie Review: Stakeout the steak in the gravy"
continue reading "McDonald’s pie review – are you taking the Mc?" 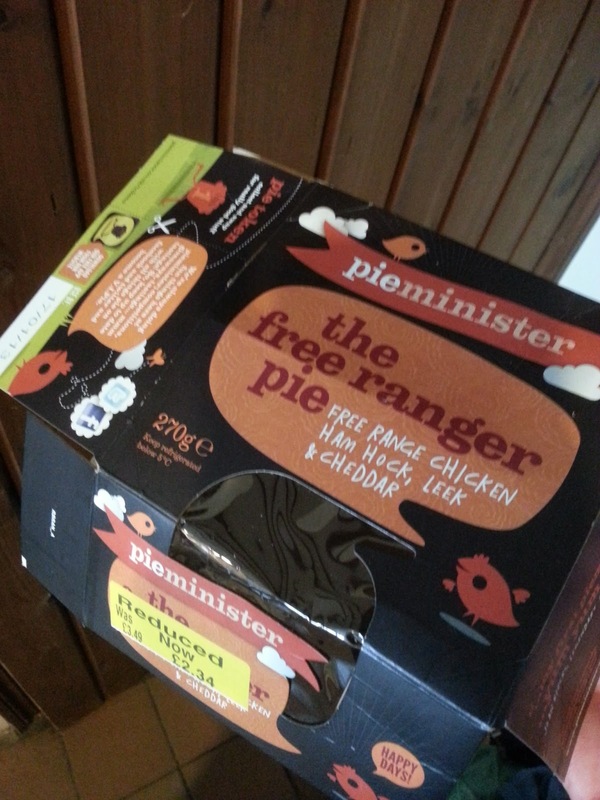 continue reading "Pieminister Pie Review: Don't be a stranger to a Free Ranger pie"
Apple and Blackberry reviewed on your Apple or Blackberry?! The sweet combination of Bramley apple and blackberry filling in a butter enriched short crust pastry should go down a treat on any occasion, but when you have around 100 hungry mouths to feed on a weekend away, the pressure really is on to hit the sweet spot! 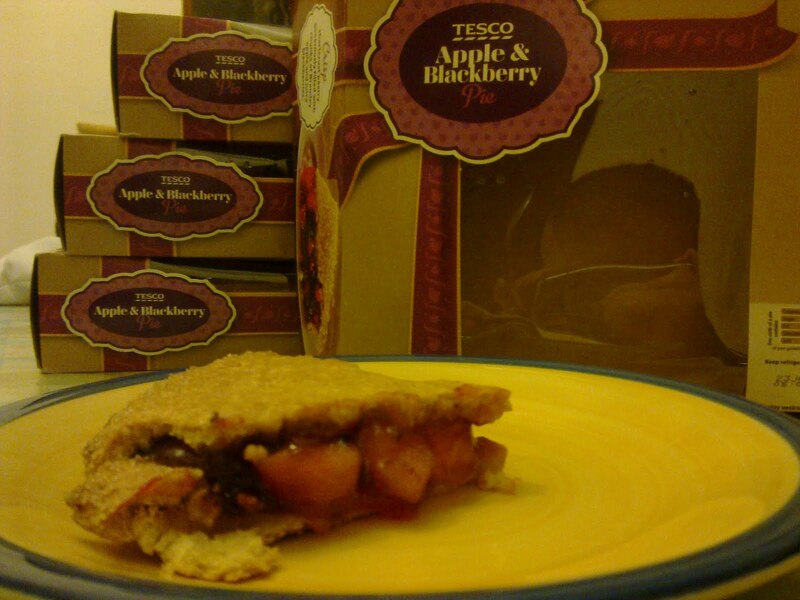 So in steps Mr Tesco with the Tesco Apple & Blackberry Pie. Sure, it will no doubt taste quite similar to the recently reviewed Tesco Bramley Apple Pie, but what would the blackberries add to the mixer? "happen" to get in the background?! Well, once again the Tesco sweet pie really does contain tasty chunks of Bramley apple and juicy blackberries in a delicious sweet sauce. There’s certainly no missing them, as they are slightly chewy due to their crisp nature, but the content is good and capacity next to bursting! The flavours complimented each other well and the golden coloured sweet butter enriched pastry. The short crust pastry was lovely and crunchy – perhaps almost a little too much bite to it but generally of a very high standard. The lid and base had no signs of sogginess, coming out in very good condition, and the filling was particularly fruity and full of flavour. While not blown away, it was a very reasonable pie (reasonably cheap at £2.60 for 8 slices) and I would certainly commend it. 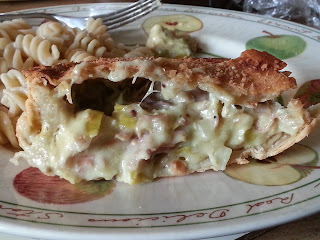 The taste was certainly consistently good throughout the pie. It seems like Tesco have finally got something right! And as for the cryptic title of this blog post... well hopefully this pie will receive a few more thumbs up in the coming days, as this pie is planned to be part of an unofficial world record attempt, as we get as many reviewers as possible on the weekend away to use their mobiles and have their say on the pie too. Watch this space! continue reading "Apple and Blackberry reviewed on your Apple or Blackberry?!" 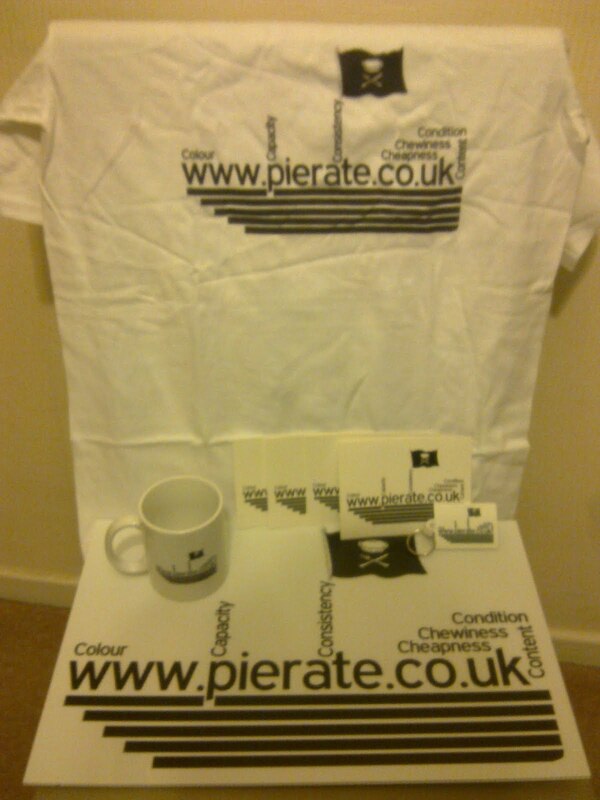 continue reading "The pierate shop sets sail"
continue reading "It's punny how you say that..."
continue reading "Attention! 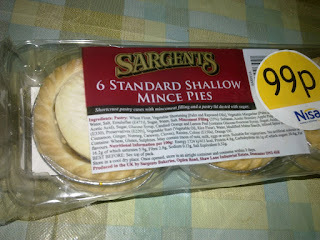 Sargents Mince Pies come up shallow"
I've come here to Clerkenwell, London, to sample a pie from Clarks Pie and Mash Shop. It looks to be quite a traditional pie joint, with a brown and green painted shop front that promotes the sale of eels and pie & mash. A man hovers outside. He is on the phone, and appears to poke his head in and out of the door several times. Once inside, I see a hand-written price list on the wall. It seems to be quite non-specific - giving the price for 'one small pie and mash', 'one large pie and mash', 'two large pies and mash', and 'eels'. There doesn't seem to be a list of pie fillings that I can see anywhere. 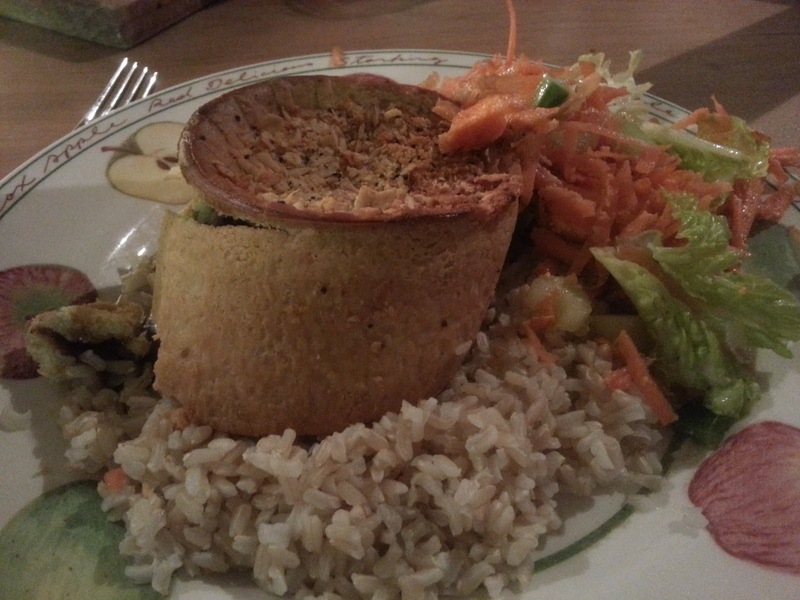 When I am served, I ask for a 'large pie' in the hope that I'll be given a list of fillings I can choose from. I am not. I am instead just served, at an acceptable cost of £2.20, one non-specific 'large pie' in a take-away container. Well that's fine, I think, perhaps they only do one type of filling. And then as I left the shop, it struck me - perhaps this pie joint is so traditional that it is actually an eel pie? I cut open the pie just to check. Luckily it doesn't look like any eel I've ever eaten (eel is actually quite nice, but I just wasn't in the mood for that sort of thing today) - it looks like it is probably minced beef. Potentially. As you can see from the picture, the pie looks a little strange to me. The pastry, rather than being flaky, feels to me a bit rubbery and looks quite anaemic and flabby. The base of the pie is suffering from what Mary Berry would call "soggy bottom", and although the top crust of the pie is firm, it is not crispy and has no crunch. I also feel the pie looks quite small for a 'large' pie - but perhaps the 'large' actually referred to the mash (which I didn't order) rather than the pie itself? The condition the pie was presented to me wasn't great - in an oversized polystyrene box. 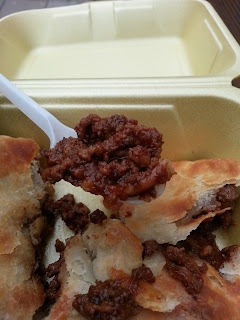 What some of the pie vendors these days are doing are selling their pies in clever cardboard boxes - a much nicer presentation I think. I am still none the wiser about the content of this pie - but this can often lead to a pleasant surprise! But unfortunately I wasn't pleasantly surprised in this case. The filling - I'm not sure, some kind of miscellaneous minced meat, likely candidate beef - looked and smelled a bit like cat-food to me. I know that sounds a little harsh, but I really couldn't get this thought out of my head. 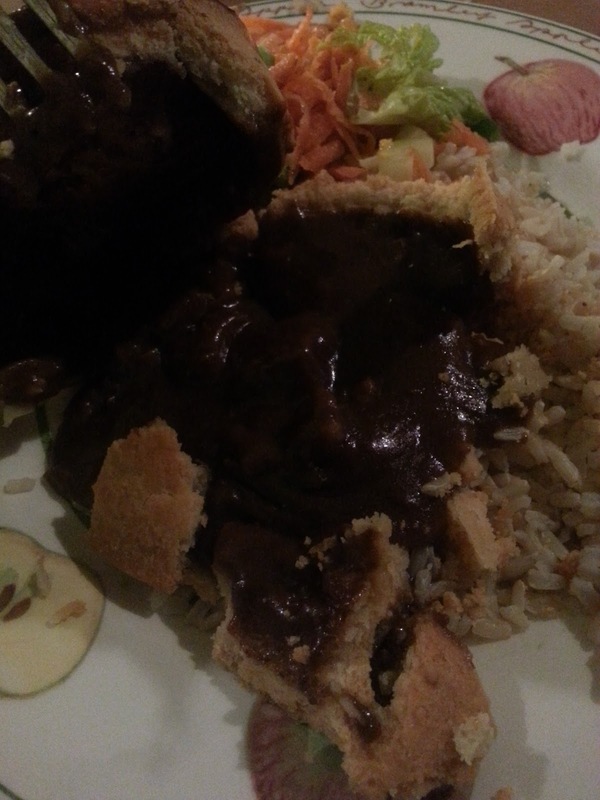 I'm quite glad I didn't order two pies, which I was considering, because even after one pie I felt a little queasy. I had to stop by at a local newsagent to buy a strongly-flavoured fruity soft drink to remove the cat-foody taste from my mouth. For a shop that specialises in 'pie & mash', I would have expected much much more. This was just my opinion though, I have heard good things about this shop. 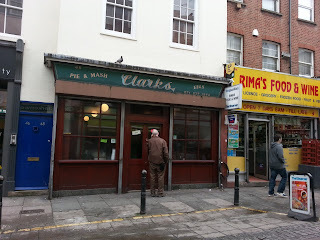 continue reading "Clarks Pie Review"
continue reading "ASDA Pie Review: Empty promises and empty pies?"